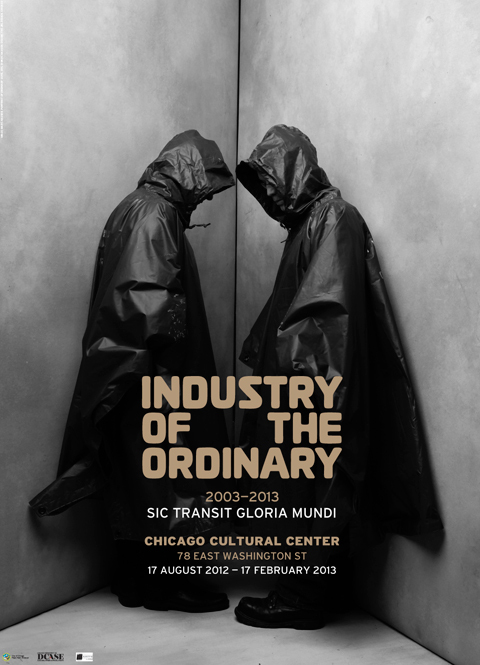 Industry of the Ordinary had a mid-career survey, Sic Transit Gloria Mundi: Industry of the Ordinary, in the main exhibition hall on the 4th floor of the Chicago Cultural Center, 78 E. Washington Street, Chicago, from 17 August 2012 until 17 February 2013. Zimpel's modified lake map/fish tank/sculpture provides participants with a fishing experience. Sign up for your chance to be an angler in the Exhibit Hall or online at www.jimzimpel.com. Looking through a telescope, the artist will observe & describe the public from a 2nd floor location in this outdoor interactive sound installation. This multi-media installation presents Tehran through the experience of Allahyari's embodied self and that of her peers, and attests to their mobility within the city along with their inability to return after having left. 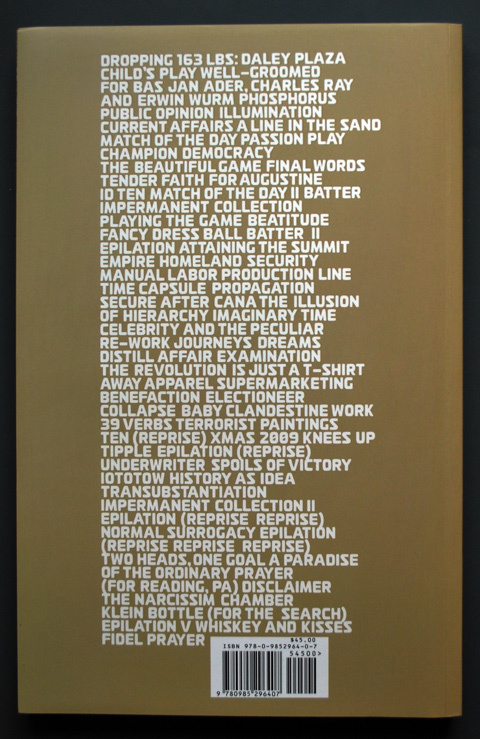 Contestants in this competition will consume cakes decorated with images of The Last Supper, vying for an IOTO-generated prize, after which IOTO will auction off the coordinates of a piece of treasure buried somewhere in the United States of America. This space promotes companies and individuals who make locally manufactured products. 24 hr. performances by student artists, start time noon each day. IOTO will walk a refrigerated case with a butter sculpture of President Obama through the streets of Chicago, starting from the Meat Packing District and on to the Cultural Center, documenting its reception along the way. A series of presentations of new media, installation and performance by several emerging Chicago artists. Group recitation of the last words of Lee Harvey Oswald from time of Kennedy's assassination until Oswald's assassination. For this panel, portrait scholar Amy Mooney will moderate a panel with artists Kelli Connell, Myra Greene, and Cecil McDonald, who are all included in the IOTO Portrait Project. Scrolling translations of I WANT TO BE ORDINARY will be projected on the facade. An installation of tents infused with celebrity scents. Based on the 1930's New Bauhaus designed wood paneling of the South Side Community Art Center's Margaret Burroughs Gallery, Majeed's wood panels serve as a didactic tool that physically records the artists and community that utilize them, including a mural by legendary muralist William "Bill" Walker. This collaborative dance project draws on relationships between Voguing and Ballet. The modular visual units, by Anna Kunz, combine ordinary materials and elements from art and design of those eras in dance and culture. The dance performances are choreographed by Paige Cunningham. Co-created by Katinka Kleijn, cello, Daniel DeHaan, composer, and Ryan Ingebritsen, sound designer and composer. 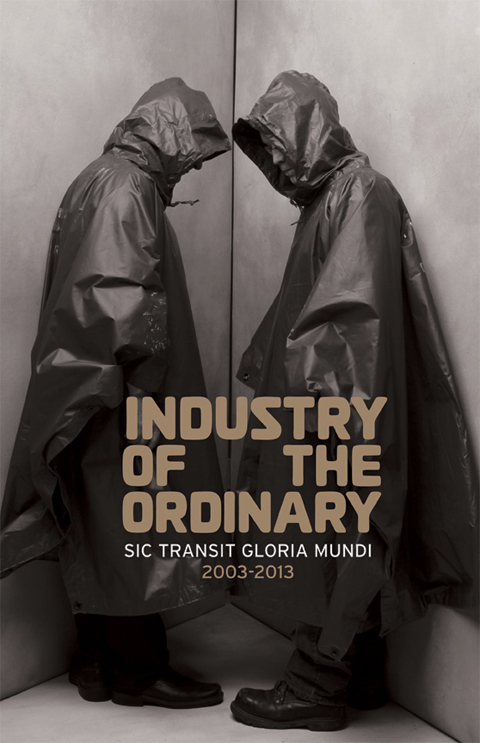 To accompany the exhibition at the Cultural Center, Industry of the Ordinary have produced a 200 page catalog that documents all of their projects to date, as well as including an essay by Eleanor Heartney and an interview with Duncan MacKenzie. The catalog features a repository for inclusion of documentation of work produced throughout the run of the show. 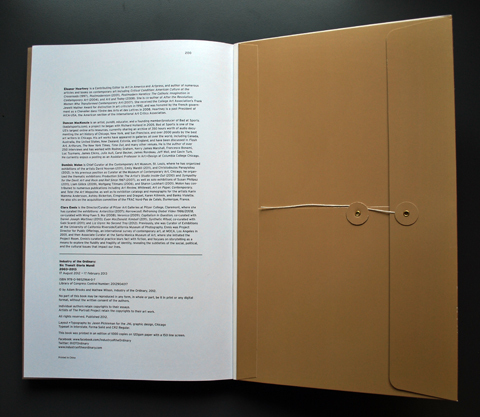 Publication design by Jason Pickleman, JNL Design, Chicago. Cover image by Marc Hauser. To purchase the catalog through Paypal, click below.